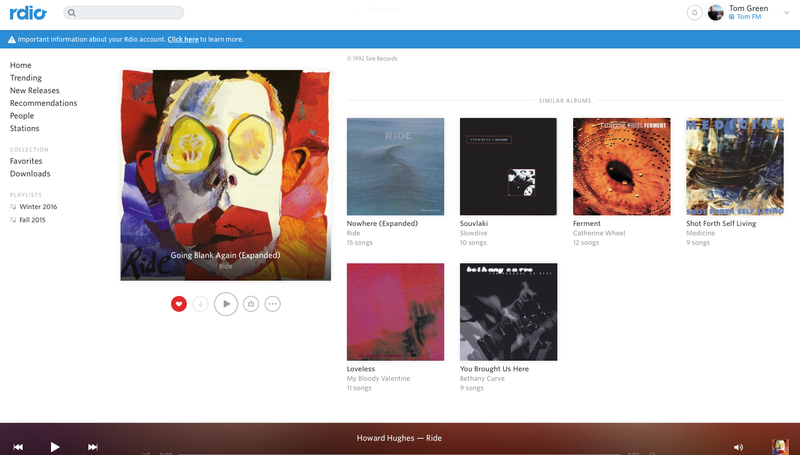 What made Rdio's UX so good? On December 22, Rdio finally shut down its service, a beautiful, on-demand music streaming application, which didn’t do anything extraordinary when it came to functionality - they had discovery, sharing, playlist management, and a mobile offering just like their competitors. But it was the user experience that set it apart from others like Spotify and Apple Music. Simple, organized, intuitive, and mobile-first. Clean, simple UI - Screen density is often an issue with music apps trying to cram every piece of recommended content and social function on the screen at once. Rdio's beautiful, simple design (with plenty of white space and good use of color and typography) makes for a clean interface so users don't get overwhelmed with all of the options and content being shown at any given time. Users notice important things like calls to action since they stand out so well. Well-organized - Things are where you expect, including a small set of persistent navigation options on the left, making it easy to access stations, your favorites, what's trending, quickly and efficiently. Related content is also organized well. grouped together, and displayed cleanly. Intuitive - The sharing music dialog leads the user through the flow, including all of the available options of copying a link, sharing to a social app, or emailing (with clear placeholder text) allowing the user to get the action done quickly. Users don't have to think about how the feature works. Mobile-First - Sure, the UI collapses down to an iPad resolution very well but even in the web/desktop view, only the most important information and actions are displayed. For example, in Listening History, each row contains minimal metadata and all of the actions are bundled into an pulldown (since they're seldom used). Spotify and Apple, take note!